By Tamara Davis, The University of Queensland. But if you also add one more piece of information – for example, that matter exists – then there’s nothing marginal about it. New physics is clearly required. 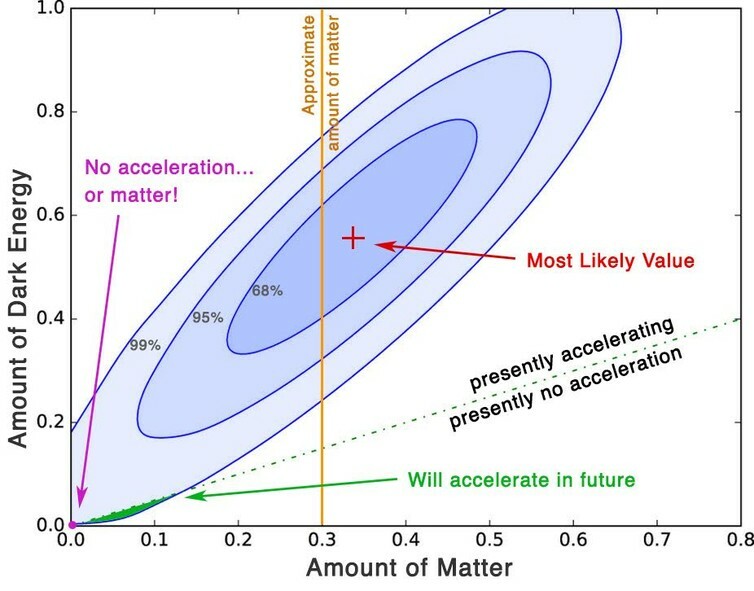 The key feature that is not in dispute is that there is some significant new physics apparent in this data. There is something that goes beyond what we know about how the universe works – something that needs to be explained. This is a reproduction of Figure 2 from the new research paper with annotations added. The contours encircle the values of the matter density and dark energy (in the form of a cosmological constant) that best fit the supernova data (in units of the critical density of the universe). The contours show one, two, and three standard deviations. The best fit is marked by a cross. The amount of matter measured by other observations lies approximately around the orange line. The contours lie almost entirely in the accelerating region, and the tiny patch that is not yet accelerating will nevertheless accelerate in the future.